Join us as we Travel the World at Metro Campus! 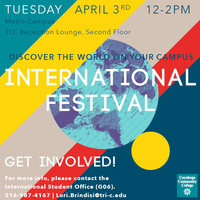 Enjoy international food, teas, music and cultural tables. Make your own piece of Origami and learn the art of Henna. I was studying about MBBS in russia at http://mbbsadmissionabroad.in/mbbs-in-nepal/ and came through this event, Great effort guys heard a lot about you.